The Architectural Engineering thesis included a fall semester focused around technical reports and a spring semester focused around a mechanical redesign. The fall semester technical reports allowed me to dive deep into the technical basis behind the Center for Sustainable Landscapes. Figuring out how the building was designed to be LEED Platinum was an educationally rewarding experience. The spring semester mechanical redesign of the roof and geothermal system allowed me to apply theoretical knowledge in class to a real world project. Overall, the course met the challenging and time-consuming expectations. Through its writing and research intensive requirements, communication and focusing skills were further refined. CPEP, or Capstone Project e-Portfolio, was an effective tool for the documentation and distribution of my thesis work through the medium of the internet. I personally enjoyed the web authoring and design aspect of the Architectural Engineering thesis. The discussion board was an online portal to reach out to professional mentors within each of the four options (mechanical, structural, construction management, lighting/electrical). I posted several questions related to my building redesign and received responses from past PSU AE alumni from throughout the nation. Mechanical mentors were an incredibly helpful resource whenever I became stuck with a problem. They drastically expedited the research process through volunteering their real-world industry experience. 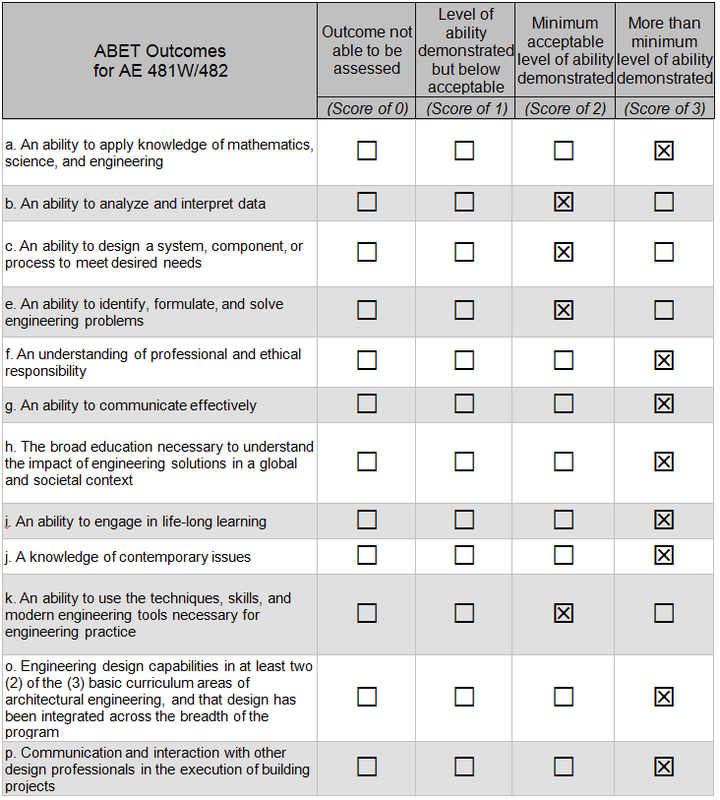 The image above links to the Accreditation Board for Engineering and Technology student survey of the thesis course.